The Snapdragon 600 version of the Samsung Galaxy S4 might have another ace up its sleeve that we didn’t know about so far. 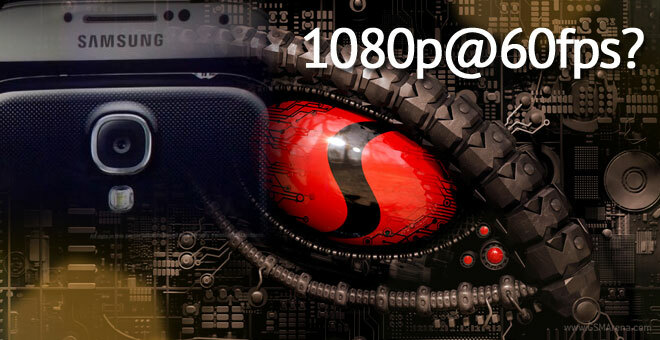 The Qualcomm-powered version is reportedly going to boast 1080p video recording at 60fps, which will be a first in the smartphone world. Update: It turns out that it was a mistake on Qualcomm’s side. The company got in touch with us to confirm it. This was mentioned as one of Samsung’s flagship key features in the chipmaker’s press release, issued after the Galaxy S4 announcement. However, the Galaxy S4 unit which we have in in our office, doesn’t offer such functionality, despite its Snapdragon chipset. So what is the truth? Samsung is having no mention of this neither in the smartphone’s official specifications list, nor in its press release. Is it possible that Qualcomm made a typo? Possible, but unlikely. Here’s why. As a system-on-a-chip maker, Qualcomm isn’t known for writing things willy-nilly. There’s a good chance the company’s PR team is well acquainted with the capabilities of the Snapdragon 600 chipset and, more specifically, the Adreno 320 GPU that’s put into use. So if we scratch the possibility of Qualcomm being wrong, then Samsung has either forgot to mention the 1080p@60fps video recording capabilities of the Galaxy S4 (but then why is it not present on our review unit?) or didn’t have enough time to work the feature out and will include it in an update later on. Assuming the S4 supports the high frame rate recording, it’ll be joining the exclusive 1080p@60fps club where we find the likes of the GoPro Hero 3 and FinePix HS50EXR. Currently, the majority of high-end Android smartphones support 60fps recording in 720p resolution, and just 30fps at 1080p. We will know what the truth when the Galaxy S4 hits market at the end of April.